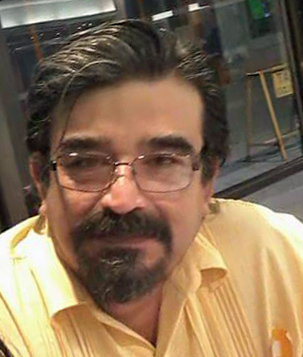 Leopoldo Zambrano Enríquez, Monterrey, Nuevo León State, México, is an example of the new generation of investigators. Independent researcher of the UFO phenomenon since November 1985. Researcher of the UFO phenomenon from October 31, 1989, to October 7, 2008, under the organization Fundación Cosmos, A. C. today inexistent. Field investigator for 15 years. Founder of the organization INFORME U. F. O. on October 8, 2008. Photo analyst since 2006. A writer of articles since 2008. UFO case analyst. Member of the UAPSG-GEFAI. Collaborator of the group of analysts of REVISTA UFO. Editor of "Meditaciones de un Fumador". 1) Do you use the acronym UFO or other designation, and if so, why? Yes, a lot, I started on the subject as a gullible red bone, so for me, UFO was an alien ship equivalent. Over the years and reading, the concept was clear and in its proper measure, the development of acronyms makes it very clear, Unidentified Flying Object, there is more to say, only that, of that to associate it with a flying contraption from outer space, there is a lot to prove. Today I believe that most of them are only bad interpretations of everyday objects that are not paid attention to when taking pictures, be it in photography or video. We can have among those misunderstandings, insects, birds, reflections, artifact errors that can be several, atmospheric, spatial, meteorological phenomena, etc. without leaving aside the cancer of fakes and jokes. 3) Should the UFO researcher become an IFO expert? Of course, I have always believed that the purpose of the ufologist is to find out what the witnesses saw. Therefore, a logical consequence is to become an Ifologist and that only the experience does. Something that is very much needed in the UFO subject are analysts, but not that they fill the photos with colored overlays that in the end alter what is seen in an image or a video, because the editors that are used work with layers altering even the areas where you do not work, but those that seek to synchronize the evidence, the place of the facts and the testimony to discard inconsistencies or find them. Even the researcher should do photographic experiments, putting himself in the place of a possible witness, to take the experience with what the images can show, but paying attention to what is taken. Something like this I did between 2007 and 2011 when some interesting photographs came from, especially with airplanes, insects, and birds and an article about the rods came out. One of the biggest mistakes of today's UFOlogists is the exaggerated paternalism with which they treat witnesses, to avoid confrontations that will ultimately lead to poor research. Spheres of light, some kind of plasma or ionized air that in some way remains longer than a sparkling floating and moving, even giving the appearance of being directed, is what I would consider true UFOs. I think more research is needed in that field. 5) How do you consider this problem in general? What do you think about the whole topic? The pressure that the ordinary citizen has exerted on the groups that officially investigated the issue, the desire to have an explanation of something that the generality considers alien to our reality and the way in which the media address the issue, have created an awareness of an elusive phenomenon linked to outer space. This is how they themselves seek or create stories around the subject to keep it full of mysteries, such as telling horror stories around a campfire. Then the cycle begins, a second round reads or listens to those stories and counts them as true, the group of people who know those stories grows and a third level gives truth by listening to them from different sources. The cycle repeats itself and little by little we have the atmosphere saturated with stories that are reinvented by word of mouth while on the way new myths are created. All that tangle of stories clouds the environment in such a way that you can no longer recognize which events are real or which events are not. Nor can we see the phenomena, if there are any, that really is something strange, because where everything seems extraordinary, in reality, nothing is. 6) Is it possible to do something effective to bring the truth to the public and change the mindset of those who still proclaim or believe that extraterrestrial beings are living with us on Earth? Besides, people like to be surprised? How can you confront this machinery of lies if you bribe the public with 15 minutes of fame when referring their cases, whether or not they are authentic? How can we create a common front against this quackery if nobody pays us to dedicate ourselves full time to this as they do with them in conferences, talks, book sales and so on? How do you make them understand that reptilians do not exist if they do not have the slightest idea of biology and genetics to know that their genes are not compatible? 7) Do you think that SETI and similar searches are valid activities? Yes, they are valid, although somewhat naive and touched by popular culture, because it is assumed that an alien civilization if it has and receives our signals, developed in a similar way to ours. Frank Drake is no longer so convinced of it, besides that the signals sent by the space are about to disappear in the background noise. But even so, I consider the attempt valid, as well as the one that is made by looking for suitable planets for terrestrial life, regardless of whether it takes us 1 million years to reach them or that when we arrive we find that they no longer exist. We must focus on these issues as humanity, and the attempts to find suitable environments for life as a beach to reach in case our Earth ship is shipwrecked. The reason for these searches is not to start a conversation with other civilizations, but to know that humanity can survive in Space, we must disperse our seed to survive. It should be seen from that perspective. Those are conjectures that sound very fantastic on paper like many other things in classical physics and quantum mechanics, but, as Dr. Miguel Alcubierre Moya said, many things are obtained on paper, it does not mean that they actually do. There are things on paper that have never been seen and many others that have come to be verified but does not mean that everything that is calculated and seems valid exists. However, as a mathematical possibility, there they are, but we can only speculate about possible parallel, twin, holographic or interlaced worlds.